A Philadelphia police officer is in critical condition after being shot in the stomach this morning following a chase that ended in a corner store. The shooting happened around 11:55 am near 4th and Annsbury Streets in the Feltonville section. The incident began when the suspect was pulled over for a broken taillight near 5th Street and Allegheny Avenue. The driver, 31-year-old Eric Torres, suddenly sped off and the pursuing officer lost him. Calls to 911 led police to the Almonte Mini Mart where the suspect was found inside. Several officers responded to the scene. During a struggle, Torres was able to shoot 41-year-old Officer Edward Davies in the abdomen underneath his vest. 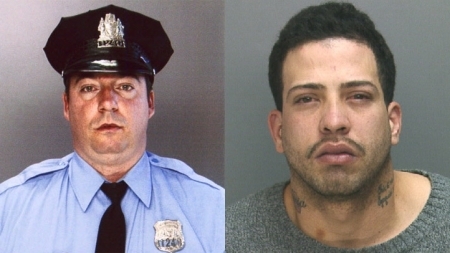 The other officers quickly took Torres into custody and Davies was rushed to Temple University Hospital. Torres used a .45 caliber Glock that was reported stolen last year. He has been arrested 12 previous times. Davies is married and a 6-year veteran of the Philadelphia Police. He sustained a life-threatening injury but officials are hopeful for his survival. Heavy rains and strong storms this morning and early afternoon have caused Flash Flood Warnings across the area. Many roadways were underwater around the region this morning leaving some motorists stranded after four to six inches of rain fell in some parts of the suburbs. SEPTA and PHL airport also experienced delays. Some drivers had to be rescued as their vehicles became stranded in the waters. The shore was also hit hard by the same line of storms. Ocean County was under a Tornado Warning. There was a confirmed touchdown of a EF0 twister in Manahawkin with winds of 85 mph. The roadways along Long Beach Island were flooded over after the storm came across the bay. Tonight the rivers and creeks are still swollen with runoff and rising, so be careful when driving near or through water. Philadelphia firefighters are searching for a 16-year-old boy who was swept away by the Pennypack Creek in the Northeast. They first got reports at around 5:00 pm that he went missing while playing with 3 of his friends. They are searching the creek along Frankford Avenue in the Holmesburg section. The creek is swollen and fast-moving from the heavy rains this morning.